As an Englishman, I am both incredibly excited and terrified for the impending World Cup. As a huge football fan I can't wait, but I do know it's not just football fans that get involved in the world's biggest sports competition. I've taken the liberty of putting together some of the must-know terminology for the World Cup in Brazil as well as a brief explanation of the game itself. 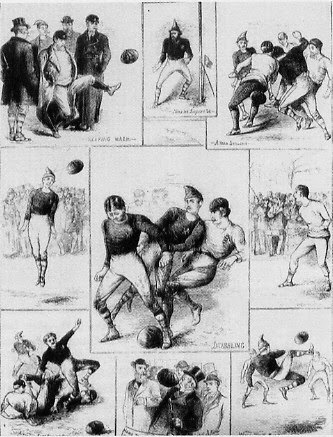 played between England and Scotland. Football is played on a pitch (UK) or field (US). The match (UK) or game (US), lasts 90 minutes, divided into two halves of 45 minutes. At the end of each half injury time is added to account for any time lost due to stoppages during the game, such as substitutions or injuries. Players: The objective of football, like many team sports, is to score more goals than the opposition. This is done with a team of eleven players. The first, and often shirt #1, is the goalkeeper, goalie, or keeper, the only player allowed to touch the ball with their hands or arms. Generally, the remaining players are categorised into the three sections of the pitch where they play. Defenders obviously play a defensive role and attempt to stop the other team from scoring goals with the help of the keeper. Midfielders spend a lot of their time in the middle of the pitch either assisting the defence or creating opportunities for the attackers or strikers, who play nearer the opposition's goal. Substitutes: Each team in the World Cup brings a squad of 23 players and the remaining 12 players who are not playing sit on the bench, a term which also refers to the collective of players that can be substituted onto the pitch in place of another player. Fouls: Like a number of sports, the rules can be complicated. The main thing to know is that football is a contact sport, but not full-contact like rugby or American football. When a player impedes another or is guilty of dangerous play, a foul is given. Any foul committed outside of the penalty box will result in a free kick, whereby the impeded team will restart play from where the foul was committed. Bookings and Cards: Players who commit a foul risk being booked. A booking is when the referee punishes the player by either brandishing a yellow or red card. A red card is issued for serious offences and the player must leave the pitch and cannot be replaced by a substitute. A yellow card acts as a warning to the player, and two yellow cards are equal to a red card and hold the same punishments as a red card. The following are a few words that are commonly used in reference to football that may be confusing to those not familiar with the game. Chip: A type of kick when the player lifts the ball into the air with the laced part of the boot rather than the side of the foot along the ground. Clearance: In dangerous defensive situations, the players on the defending team will attempt to distance the ball from their own net and alleviate any offensive pressure from the other team. Equaliser: The goal scored by the team with fewer goals in order to bring the score level, or equalise the score. Extra time: When the scores are level at the end of both halves, the match will be played for another two halves of 15 minutes each. FIFA: The International Federation of Association Football, though the acronym is from the French name. FIFA is the international governing body of football. Friendly: A friendly match is played between two teams outside of a competition, often in order to practice in a competitive environment. Many of the teams participating in the World Cup will be conducting friendly matches prior to the competition itself. Hack: A fantastic term referencing kicking the shins of another player but also used to refer to dirty, underhanded, and unfair challenges for the ball. Nutmeg/meg: When the player in possession of the ball plays the ball between the legs of the opposition player, either while passing to another player on their own team or as they run around the opposition and retrieve the ball having passed the opposition player. Offside: A rule of football that football fans consider simple but others do not. I am not going to attempt to describe it here. Let a friend attempt to describe it in the pub using various glasses of beer to represent the players on the pitch. Shoot-out: If the score is level at the end of extra time, teams will take turns taking penalty kicks (PKs) or penalties. The teams take alternate penalties until a best-of-five winner is decided. If both teams are level after each taking five penalties, the penalties become sudden death, whereby the game will continue if the scores are level after each team has taken an additional penalty, or will end once one team scores and the other doesn't. Soccer: The term for football in many places where a different type of football is played, such as the US, Canada, and Australia. Tackle: Tackles in football do not resemble tackles in rugby or American football. A tackle in football is retrieving the ball from the opposition player using the feet or legs. The Upright: The upright refers to the vertical posts that attach to the horizontal crossbar. We'll be watching the World Cup starting next Thursday. Who will you be supporting? Let us know in the comments.